A College Algebra student wondered whether there could be a function such that its inverse is the same as its opposite. That is, can there be an f such that ? I had to work graphically to think this through, which you see above. That task is now an A Assignment. What is it like to be Christopher’s College Algebra student? I happened across a review sheet for another instructor’s College Algebra exam today. I know not whose, nor do I wish to know. I just want to use it as an example of what my poor students have to go through. There were eight tasks on the review sheet. I would like my students to have the skills represented in those tasks for sure. But I wouldn’t happy with just those skills. So here are the tasks. Each is followed up by the sort of question I would ask my students on an exam. Pity them. Original: Find the domain and range of . Follow up: Give two more functions: one that has the same range as f but a different domain, and one that has the same domain as f but a different range. Original: Is even or odd or neither. Follow up: Can a function be both? Original: Solve the absolute value inequality and graph the solutions. Follow up: How do these solutions relate to the function ? 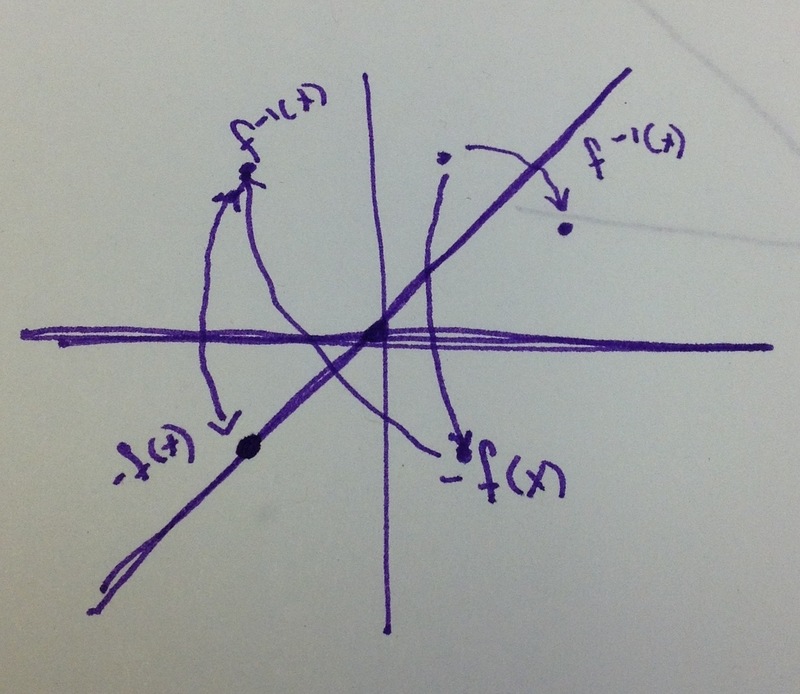 Original: Graph the function . Then find the intervals on which f is increasing and decreasing. Are there any local maxima or minima? If yes, where are they located? Follow up: Choose two points near a maximum or minimum value (if such a value exists). Find and comment on the average rate of change between these two points. Original: If , find the net change and the average rate of change between and Follow up: Why are these values different? BONUS: Give a new function for which these values are equal between the same two points. Original: If , write the transformations that yield . Also graph both and on the same coordinate axes. Follow up: How many solutions are there to this system of equations? Original: If and , then what are and ? Also list the domain for each case. Follow up: Choose one of the four functions you wrote. Write its inverse (if such a thing exists). Original: Graph this piecewise function Follow up: There is a gap in the graph. Change the second piece of the function to eliminate this gap. Can’t get enough of logs! I have written a lot about logarithms this past year and I keep wondering about ways to get students’ minds wrapped around the relationships that logarithms are intended to express, and to focus less on the notation. Here is a fact family for an exponential relationship. We’re not used to thinking about roots, logs and exponentials all at the same time. Maybe we should be. Exponentiation is not commutative, so we only have three facts in the family, not four. That seems useful to know. All non-commutative binary operations will necessarily have TWO inverse operations in their fact families. How much more is 5 than 3? 3 is part of 5; what is the rest? I’ll expand on these here, and consider how all of this relates to the larger question of inverse functions and operations. There has been a long-term research project at the University of Wisconsin, Madison called Cognitively Guided Instruction (CGI). That project was founded on the principle that if teachers better understand how their students think about mathematics, they will be more effective teachers. One of their early major results was documenting that children have a variety of strategies for solving addition and subtraction problems before they have been taught addition and subtraction. What is more, the types of situations children encounter in these problems influence what strategies they use more than whether it is formally an addition or a subtraction problem. In particular, they identified four major categories of problems based on children’s problem-solving strategies: Join, Separate, Part-Part-Whole and Comparison. Briefly, a Join problem involves two sets being joined together; a Separate problem involves one set being separated into two sets; a Part-Part-Whole problem involves two parts making up a whole, but without any physical action joining them together; a Compare problem involves comparing the sizes of two different sets. Depending on what is known and unknown in the problem, each of these four types encompasses problems that can be solved with subtraction or with addition. The CGI argument is that student strategies correlate closely with these problem types, rather than with the more formal categories of addition and subtraction. So subtraction conception  above, from Whit’s original list, is a Separate problem. is a Join problem. is Join with negative numbers, which is beyond the scope of the original CGI work. Now, from addition we get repeated addition, which is the main conceptual entry point to multiplication. Its inverse is division. Whit’s three generalizations about inverse functions-that they tend not to share convenient properties with their originators that they necessitate new numbers, and that they can be conceptually more challenging, are likely borne out in the multiplication/division example. It would be equally interesting to consider what the major categories of multiplication and division concepts should be. Depending on whom one asks, there can be as few as two categories for division or many, many more. Next, from repeated multiplication we get exponentiation. Its inverse is logarithm. Once again, Whit’s generalizations apply. But I have not seen anyone try to categorize concepts of exponentiation nor logarithms. Perhaps this is because we have reached some threshold of abstraction in which people only think about these concepts in a formal way. But that seems unlikely-few people think only formally and most people think informally before they can think formally. And this is the greatest lesson of CGI-if our informal conceptions of addition and subtraction influence how we solve problems at an early age, isn’t also likely that our informal conceptions of other operations influence how we solve problems later on?